It’s almost time for one of the more exciting international events of the season as the U.S. Men’s National Under-18 Team is getting set for the 2013 IIHF World Under-18 Championship in Sochi, Russia. The World Under-18 Championship features 10 top international squads with players primarily aged 16 and 17. As such, many of the players competing in the tournament are 2013 NHL Draft-eligible and many top prospects will be in attendance in Sochi. It has become one of the biggest scouting events of the year, but for the competing nations, this tournament provides important international experience for its players. 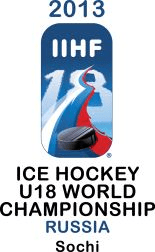 Sharing the exact format of the World Junior Championship, the U18 Worlds is a smaller-scale version of the WJC. Many of those competing here will play large roles on future World Junior squads. Some of the all-time great performers in this tournament include Alex Ovechkin, Zach Parise, Phil Kessel, Steven Stamkos and Evgeni Malkin. Team USA is in search of its record fifth consecutive gold medal at the U18 Worlds in 2013 and eighth overall at the event. Additionally, the U.S. is on a U18 medal streak that dates back to 2004. Adding a bit of intrigue to this year’s U18s is that all games at the tournament will be played at the two venues that will host the 2014 Olympic Winter Games, the 12,000-seat Bolshoy Ice Dome and 7,000-seat Shayba Arena. This is the first major test event for both facilities as the city gets warmed up to welcome the Olympics in 2014. You can find Team USA’s complete roster here. The U.S. Men’s National Under-18 Team will play its only tuneup prior to the 2013 IIHF World Under-18 Championship in Sochi at the Ice Dome Sunday against Canada, which is still paring down its roster. Puck drop is set for 7 p.m. local or 11 a.m. ET and is expected to be carried live on FASTHockey.com. I’ll have the call beginning shortly before game time. I’ve been embedded with the U.S. squad for all of its pre-tournament camp, which began on April 10 in Sochi and will be here straight through the tournament providing live play-by-play for FASTHockey.com of all Team USA games, which will only be available in the United States. A complete breakdown of Team USA’s roster for the World Under-18 Championship will be up Monday. The tournament will begin Thursday, with the U.S. taking on host Russia at 8 p.m. local/noon ET. You’ll be able to find complete Team USA coverage right here on The United States of Hockey for the entire event.